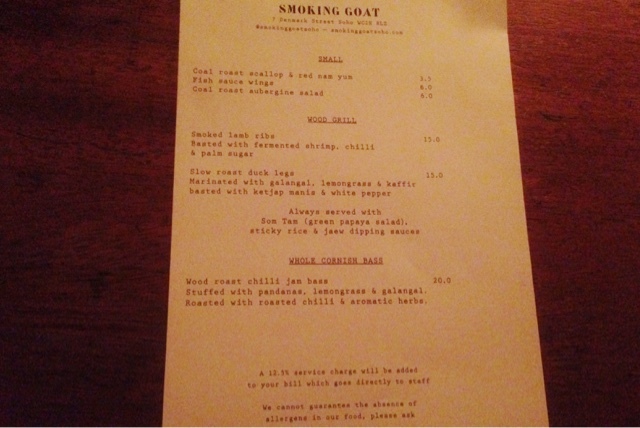 Smoking Goat, London | ivy eats again. It's not easy to get the balance of bird-eye's chillies and fish sauce right, but when it is done right it can be some seriously delicious Thai food. Smoking Goat is a tiny Thai restaurant situated on Denmark Street. It's not your everyday thai curry that you will find here. With only 6 items on the menu, concentrating on Thai barbecued food. From previous reviews, tweets and instagrams, I had high hope and was expecting getting messy. I was looking forward to eating crab (even though I am allergic to it) but sadly the menu has changed to seabass. Whilst waiting for Mr T to arrive, I ordered myself a pint of beer (can't remember the name). Light and refreshing. A little disappointment they've ran out of scallops already around 7pm so we went for the fish sauce wings. 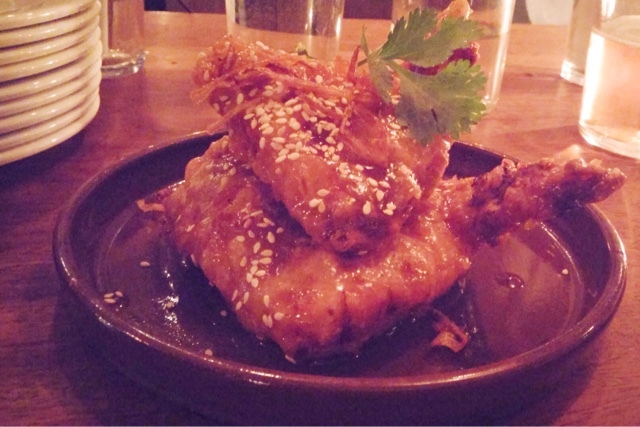 Crispy coating and a sticky glaze, it was finger licking good. The fish sauce was not over powering but it was severely salty towards the last few bites, which Mr T didn't find it salty at all. Glad I ordered that pint of beer. 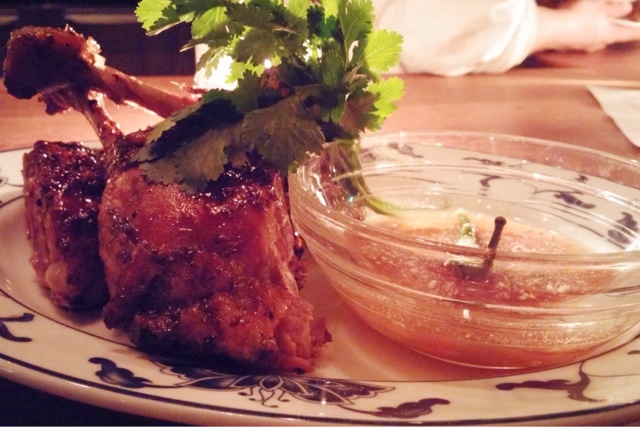 Smoked lamb ribs basted with fermented shrimp, chilli and palm sugar was very tender, the layers of meat and fat tore off the bone in chunks. The slow roasted duck legs (marinated in galangal, lemongrass, kaffir and basted with ketjap manis and white pepper) was different to what I had in mind, I was thinking of French stews where the meat was stringy. 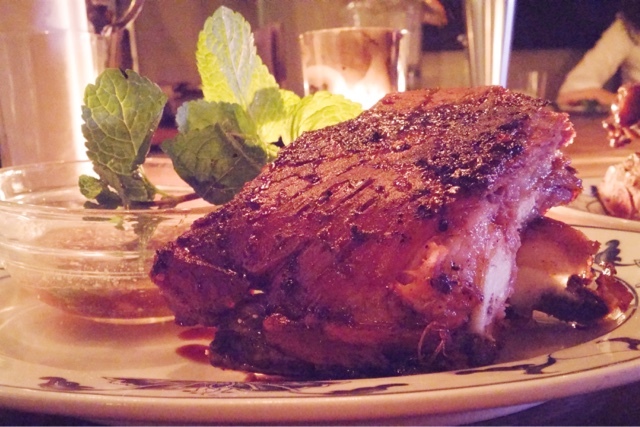 The sweet glaze gave the skin a crispy finish and the meat was still moist and firm. Both meats was accompanied by a dipping sauce which tasted very similar to me or it could be two different sauces, what the heck it was tasty.A little forgotten, mains are also served with sticky rice and som tam. 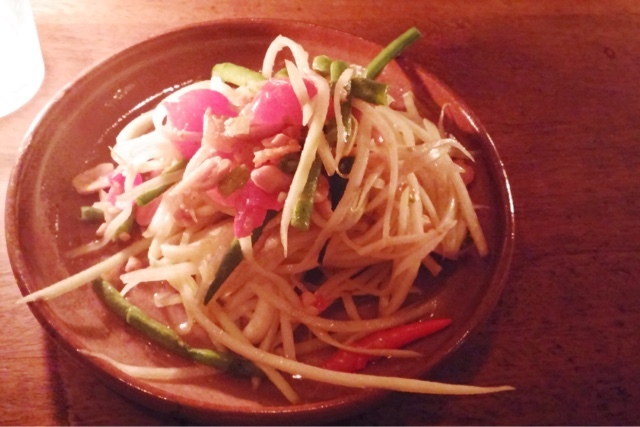 Som tam, a green papaya salad packed with flavour and heat. I was breathing fire at the end of the meal. Luckily the day we went, there was no queue but the restaurant was running very busy. It's not a place for a hot date and if you're vegetarian, it's not for you either. As you can tell, I like Smoking Goat. 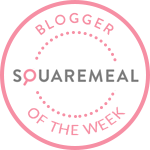 Like all the unanimous reviews praising for the quality of food, winning as a London favourite. I really cannot disagree. I don't know if it is a one-off bad serving of over salty chicken wings or is it just me, I still want to return again and given the price it's inexpensive.